Republican Senator John McCain, who is currently on a visit to Israel, said on Friday that Prime Minister Binyamin Netanyahu has “serious, serious concerns” about Secretary of State John Kerry’s proposal for a framework for peace with the Palestinian Authority. McCain is in Israel along with Republican Senators John Barrasso of Wyoming and Lindsey Graham of South Carolina. 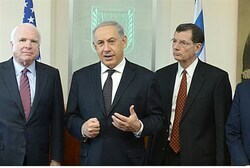 The three met with Netanyahu on Friday afternoon. “Prime Minister Netanyahu has serious, serious concerns about the plan as has been presented to him, whether it be on the ability of Israel to defend its borders or the reliability of a Palestinian state and their intentions,” McCain told reporters after the meeting, according to the AFP news agency. Israelis were also particularly concerned about “their overall security, whether it be boundaries, whether it be areas under Palestinian control,” said the former presidential candidate. McCain added that he shares Netanyahu’s concerns about whether some parts of the plan being discussed are enforceable, viable options that do not jeopardize Israel’s security, reported The Associated Press (AP). Kerry is also in the region, making his tenth visit to Israel since taking office. The top U.S. diplomat met with Netanyahu for three hours on Friday, following a lengthy discussion and dinner on Thursday. On Friday, Kerry met with Foreign Minister Avigdor Liberman before travelling to Ramallah to meet PA Chairman Mahmoud Abbas. Abbas and Kerry are scheduled to meet again on Saturday, and may make statements to the press following that meeting. During Friday’s meeting between Liberman and Kerry, the Israeli Foreign Minister expressed his deep appreciation for the efforts that Kerry is investing to achieve a peace agreement. According to a statement from his office, Liberman noted that any agreement between Israel and the PA must be based on the strong foundations of security for Israel and a stable economy for the Palestinians. He added that even if all the currently outstanding problems and differences between the parties are resolved, there are issues which will arise afterwards, and these too need to be addressed. “An agreed framework would be a significant breakthrough,” he added. In his comments to reporters, Netanyahu repeated that he did not believe the PA was taking the process seriously. “Unfortunately, given the actions and words of Palestinian leaders, there’s growing doubt in Israel that the Palestinians are committed to peace,” he said. “A few days ago in Ramallah, president Abbas embraced terrorists as heroes… How can he say that he stands against terrorism when he embraces the perpetrators of terrorism and glorifies them as heroes?” added Netanyahu, referring to the PA’s celebration late Monday night after Israel released 26 terrorist murderers as a “gesture” to the PA.
A State Department official said ahead of Kerry’s trip that he aims to hammer out a framework to guide the sides through the tough final months of talks, due to end in late April. Kerry and his team hope to have the framework in place soon, addressing the core issues. These include the contours of the borders of a future Palestinian state, the fate of Jerusalem which both sides claim as their capital, and the issue of the so-called “Palestinian refugees” with which the PA wants to flood Israel.